In the Cinderella Scholarship Pageant, dreams really do come true. Molly Thvedt, 21, from Westerville, was crowned the 2016 International Cinderella Woman. First, the senior dance student at Mercyhurst University in Erie, Pa., won the 2015 Ohio Cinderella State Pageant, held May 29-31 at the Doubletree Hotel in north Columbus. Then she went on to win the International Cinderella Pageant, held July 20-24 in Dallas. As the international winner, Thvedt received $4,000, a crown, a trophy and a banner. “It really was a dream come true. I’ve been competing in pageants since I was 15 so it was exciting to finally achieve the goal I’d been working so hard toward,” Thvedt said. At a special coronation ceremony Aug. 15 in Westerville, she passed her state title to the state runner-up, Jordan Miracle, 20, from Pataskala. Judy Keyes, Ohio state director for the Cinderella International Scholarship Pageant, said this is the third time in her 13 years that a girl from Ohio has won the international title. “International titles are really hard to win. They don’t happen very often. We’re all excited to have so many winners from Ohio,” Keyes said. Last year, Katie Carson, a 7-year-old from Upper Arlington, won International Tot. Sarah Grooms from Blacklick won International Cinderella Woman in 2007. Additionally, Angela Escobar from Reynoldsburg won first alternate as International Cinderella Woman in 2015. As the new International Cinderella Woman, Thvedt will be traveling with other winners, meeting girls and performing. Keyes first met Thvedt at a neighborhood garage sale. Thvedt was intrigued by all of the old pageant dresses that were for sale and as the two began talking, Keyes learned about Thvedt’s dance background and asked her to give pageants a try. While a student at Columbus School for Girls, Thvedt entered her first Cinderella pageant and finished in the top five. Now, when she’s not competing in pageants or going to college, Thvedt works at the American Girl store at Easton in the doll hair salon. “Everyone loves Molly. Little girls just flock to her and follow her around. 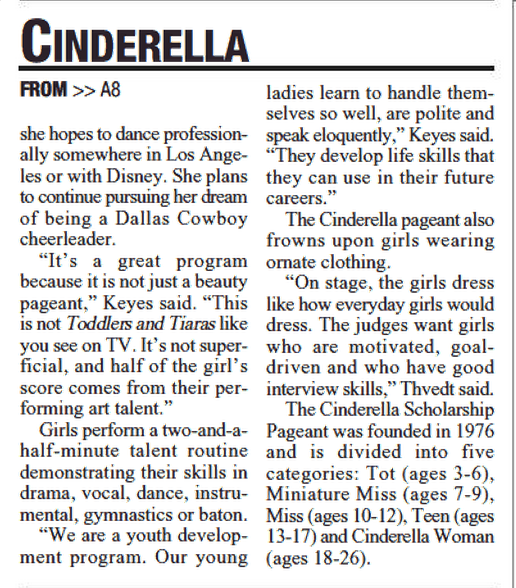 She’s such a wonderful role model to them,” Keyes said. Thvedt said she knows girls look up to her. “I love being around them and I try to include them in many things. I like to play games with the younger girls or invite them to go see movies,” she said. Keyes said Cinderella girls have done great things, such as starting their own charity, joining a band or even becoming a Radio City Rockette. When Thvedt graduates, she hopes to dance professionally somewhere in Los Angeles or with Disney. She plans to continue pursuing her dream of being a Dallas Cowboy cheerleader. Girls perform a two-and-a-half-minute talent routine demonstrating their skills in drama, vocal, dance, instrumental, gymnastics or baton. The Cinderella pageant also frowns upon girls wearing ornate clothing. “On stage, the girls dress like how everyday girls would dress. The judges want girls who are motivated, goal-driven and who have good interview skills,” Thvedt said. The Cinderella Scholarship Pageant was founded in 1976 and is divided into five categories: Tot (ages 3-6), Miniature Miss (ages 7-9), Miss (ages 10-12), Teen (ages 13-17) and Cinderella Woman (ages 18-26).